Foreign golf tourists who come to Thailand never fail to experience the unique package of attractions that make the Land of Smiles one of the top three golf tourism destinations in the world. There are many reasons why a golf holiday in Thailand is so enjoyable and why visitors come back again and again – including the quality of Thailand’s 260 courses, all but a few of which are open to visitors. As everywhere, the top courses stand out from the rest and rank among Asia’s great layouts. In each of the next 10 posts I will focus on one of the top 10 Thailand golf courses. Here they are in alphabetical order. 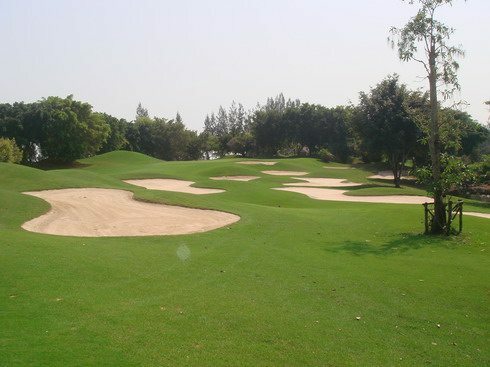 As the designer of more than 100 courses in the southern USA, Ron Garl understands the needs of the tropics and was engaged to create Alpine’s Bangkok layout. It has all the elements that have made Garl a sought-after designer in many countries, especially in hot climates. Opened in 1996, Alpine Golf Club is private, but visitors can play by booking with a licensed Thai golf tour operator. The course and facilities have a special feel of exclusivity and authenticity. It is beautifully manicured and cleverly uses its natural surroundings. Alpine is regarded as the most challenging golf course in the Thai capital by a wide margin, playing 7100 yards off the back tees. It is extremely well maintained and features lightning fast greens and undulating fairways. Most greens slope from back to front, so keeping the ball below the hole is the key to shooting a low score. In fact, shooting ones handicap is considered a good score at Alpine so walk away proud if you are one of the skilled few Thailand golf visitors that achieves this.